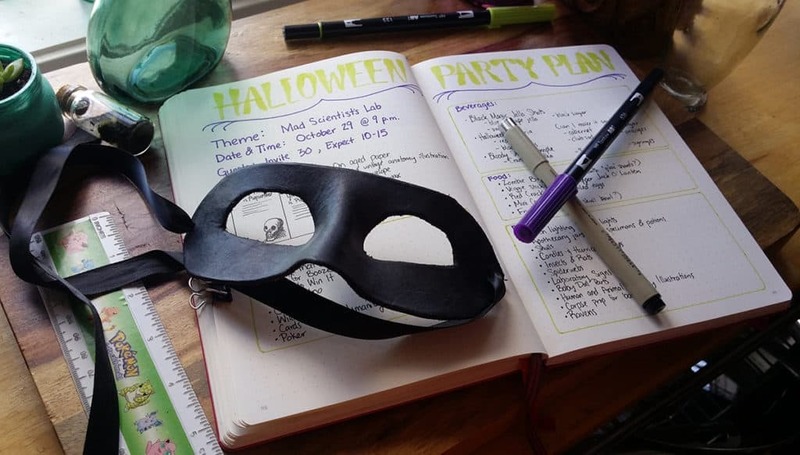 You are here: Home / Bullet Journal / Bullet Journal Party Planner – Let’s Do Halloween! 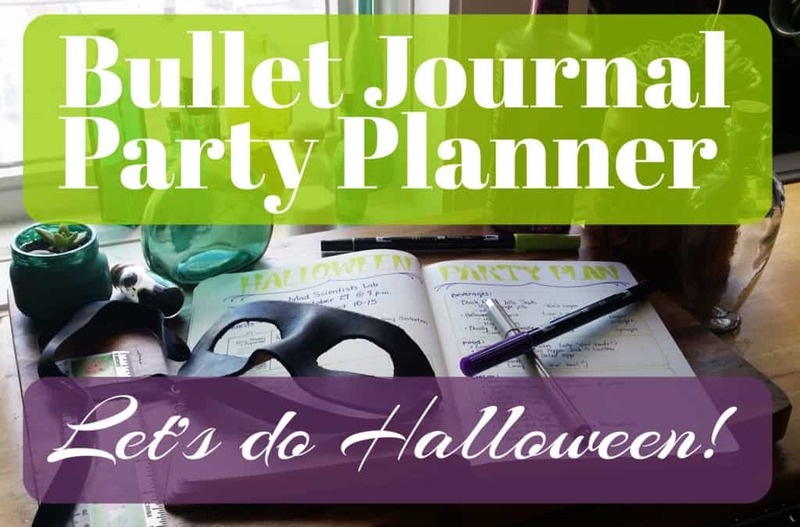 Bullet Journal Party Planner – Let’s Do Halloween! Guys, there’s something you should know about me. I really love Halloween. Like, really really love Halloween. I started getting the Halloween bug in mid-June. 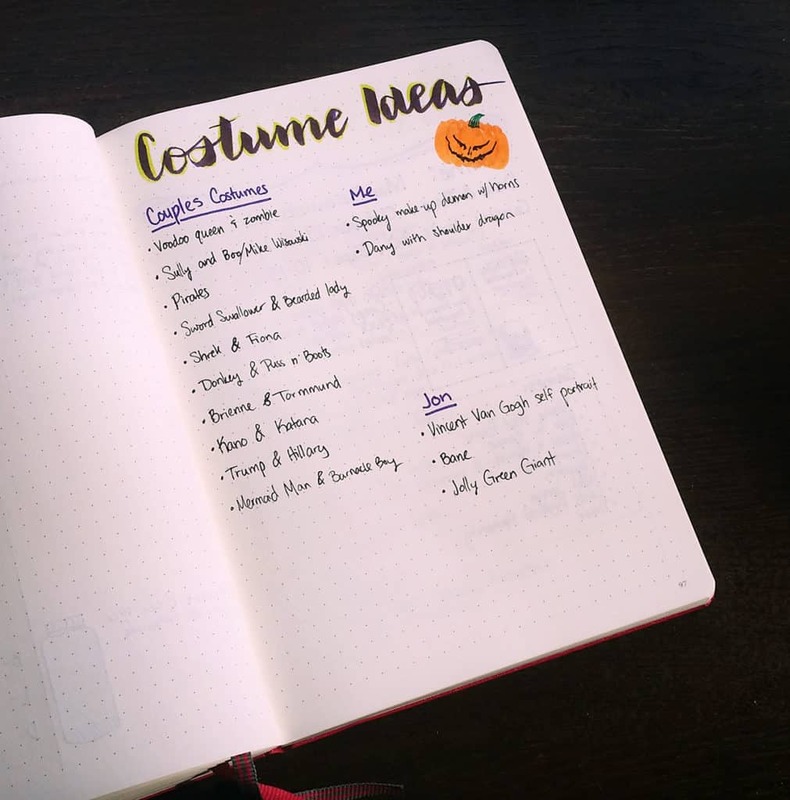 In an attempt to satisfy my urge to look up Halloween costumes, foods, and decoration ideas, I decided to throw together a bullet journal party planner! This spread can be used for literally any kind of party – birthday, Christmas, pool, movie marathon – you name it! So don’t feel restricted if Halloween isn’t your style (though maybe get checked out by a doctor, that ain’t normal). 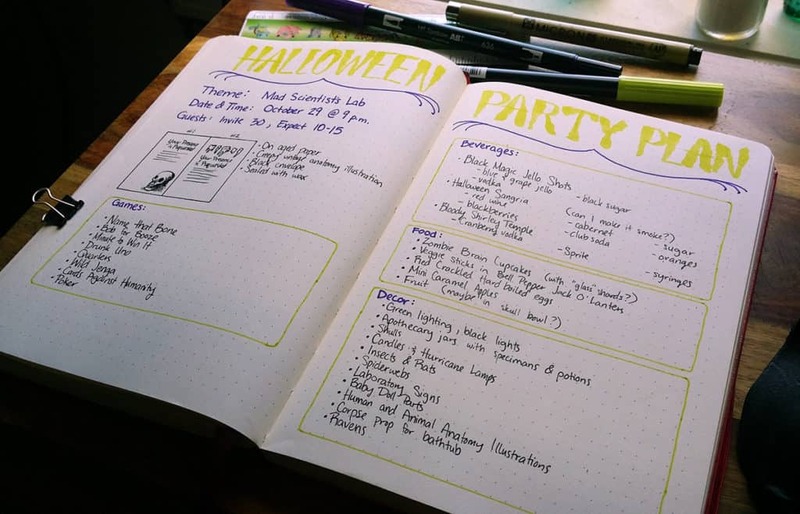 Break out the bullet journal, it’s time to plan! Let’s take a gander in my lovely dot-grid Leuchtturm. Create a header that makes you feel excited about your upcoming party. I used my Tombows for this spooky font. Alright, feeling excited? Good! The first thing you need to decide when planning your party is how elaborate you want to get. This will depend on your budget of course, which I totally forgot to put in my spread – go ahead and pretend that I had a spot for the budget. Anyway, figure out how crazy you want to get with this party. The answer to that question will dictate the rest of your planning. Next, you need to pick a theme. This might not apply to your party, but you can create a theme for lots of holidays or events. For a Christmas party, you could have a White Christmas, Dirty Santa, Santa’s Shop, The Nightmare Before Christmas, The Grinch, etc… And birthday parties? There’s crazy possibilities for birthdays. 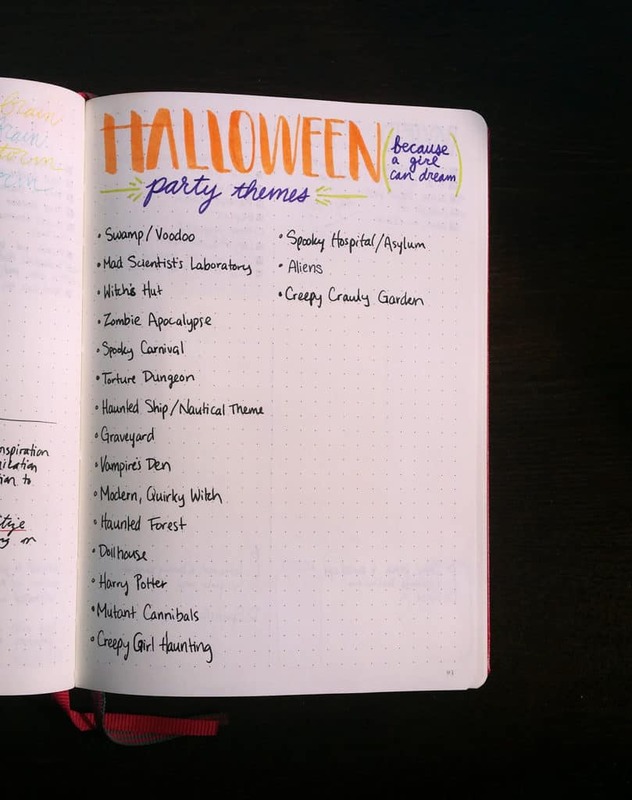 Here’s my list of Halloween party themes to give you an idea of a good brainstorming session. After you select a theme that gives you tons of inspiration, you need to determine how many people you plan on inviting and the party date. If my wedding is any indication, only about half of the people you invite will actually show. This is especially true if you are planning a major holiday party (like Halloween or Christmas), as people will often go to other events during that time. I like to keep my guest list in an Excel file so I can keep their addresses neatly sorted. 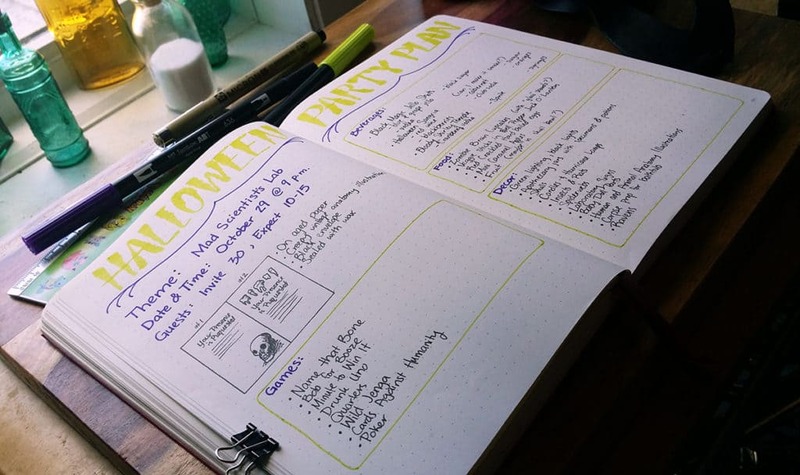 The look you want to achieve will play a big part in your bullet journal party plan. And the first impression anyone will have of your spectacular (or should I say spooktacular?) event is the invitation. You could send your invitation digitally, but I think it’s worth your time and energy to send one through the mail. A physical invitation has a lot more personality and is going to be harder to forget. Besides, who doesn’t love getting mail? For my bullet journal party plan, I drew out a few ideas of invitation designs using Microns and my little ruler to make quick, clean lines. What kind of a look do you want? For me, black envelopes will create the dark, mysterious feel that I’m going for. And what better way to add class and charm to an invitation than a wax seal? If you’re worried about writing the addresses neatly, try a Letter Mate to help guide you. One thing is for sure – I want my guests’ first impressions to be, well, impressed when they get my invitation. They should feel like they need to come to my party or they will miss out on something big. Besides the invitation, you need to focus on decor. I have a little box in my spread that goes into some of the decorations I want, but you know what? I think this could easily be its own page. If you break things down by budget and details, you can run out of room really quick. For example, I can break down how many apothecary jars and what I will put in each one. Of course, you can keep your decor list short and sweet. It’s whatever you want, darlin’! Your clothes will contribute to the look of the party, too. Of course, Halloween has a special sort of dress code. But planning out your look can be great for themed parties of any kind. You want to throw a kickin’ party and look good at the same time, so plan it out! You can keep it simple with regular party food (chips & veggie tray) or you can list out elaborate themed foods (jello worms & bell pepper jack o’ lanterns). Or you can keep your meal prep simple and keep it in fancy dishes. For example, I want to have some red fruits chopped and served in a skull dish like this one. It’s easy and still has pizzazz! Your meal spread is a great opportunity to wow and entertain your guests, so don’t underestimate the power of food. Whether you are planning a party for adults, children, or a mixture of the two, you can have some really cool drinks. I’m all about adult drinks in my bullet journal party plan because I love fancy cocktails. The amount of awesome mixed drink recipes on Pinterest alone makes my socks roll up and down. It was difficult to pick only a few, but I buckled down and did it. I’ve really been wanting to try the bloody Shirley Temples with the novelty syringes. Isn’t that so fun? If you’re doing a Christmas party, there’s cool drink concoctions for you. If you’re doing a Harry Potter or Disney movie marathon, then you are covered on the drink front. Seriously, just look up your theme+cocktails on Pinterest or Google and I bet you’ll find something awesome. Speaking of drinking, have you planned for games? Due to my small apartment, I can’t host a scavenger hunt and a murder mystery is off the table. You know what is on the table, though? Drunk Jenga. This version of Jenga has unique instructions written on each block, which means that you have to follow the directions when you pull it from the tower. Here’s a hilarious list to base it on. There’s all kinds of party games that you can round up in your bullet journal party planner. I’m sure you can find the perfect game to keep your guests entertained, whether your games are crazy or dirty or just plain funny. Minute to Win It is always a popular choice, and for the adult crowd, you can’t go wrong with Cards Against Humanity. Also, get good music! Prime Music is ad free and you can get tons of stations and playlists at your fingertips. There ain’t a party without some good tunes, so this is a must! You can try a free 30 day trial here and see for yourself. And if you’re a student, snag a 6 month free trial right here and experience the bliss of commercial free music. It’s great for studying, too (and grocery shopping, and planning, and a million other things…). Make extra food – You’d rather have leftovers than hungry, disappointed guests. Give yourself some chill time before guests arrive – Guests can feel the tension you radiate and it can affect the overall mood. Make sure you decompress so you can enjoy your awesome party, too! Share duties – If money is tight, you can ask a friend to co-host it with you to share the planning and financial responsibilities. The key to planning a party is to make sure your guests are well provided for and to have fun yourself. And believe me, making a bullet journal party plan is wonderful for keeping all your information and research together. It can take several notches off of the stress levels that come with planning a fabulous party. With the right attitude and preparation, you can be the ultimate party king/queen and knock your friends’ socks off. This was great! As much as I love Halloween, I’ve never hosted a party for it! That time of year always seems so hectic with my kids’ school schedules. Do it now before you have kids!! Lol. Have you ever seen Martha Stewart’s Halloween party ideas? She is over the top! You can usually get cool party supplies from her line, like drink labels and banners, etc. And I agree, that July isn’t too early to start planning! I’m even looking forward to decorating my journals for October! I have a bullet journal and an a5 planner. I’ll definitely need to check her out 🙂 I would lose my mind if I could go to a Martha Stewart hosted party, I imagine she would be the absolute BEST! And I’m glad you feel the same way about looking forward to October in the bullet journal. Some people think I’m crazy, but obviously they don’t understand how awesome it is!